On Tuesday, July 22, Rudy Senarighi, of Sturgeon Bay, WI, packed his bags and was on a flight to Seattle, Washington to assist in the area of Disaster Mental Health for those impacted in the WA Wildfires. We brought you Rudy’s story on July 25 and to read the first part of his story click HERE. We are proud of Rudy for putting his life on hold to answer the call to help. We are happy to share that Rudy will be coming home to Wisconsin on Thursday from his Red Cross deployment. We thank him for sharing his thoughts, experiences, and how the Red Cross is helping those impacted….here is the rest of his story. It was a long, hot day in Pateros. Up at 5:00 AM to get some coffee before the drive north for a meeting of organizations in Pateros. We set up two tents near the high school to accommodate Disaster Mental health, Health Services and Client Casework. Had a number of folks stop in, some just to sit and relate their stories. The fire has burned down enough so damage assessment can get in and take a look around. The estimate prior to this was 200 homes destroyed. They now are saying they estimate over 300 were lost. Some are talking about rebuilding, some are just leaving, its sad. 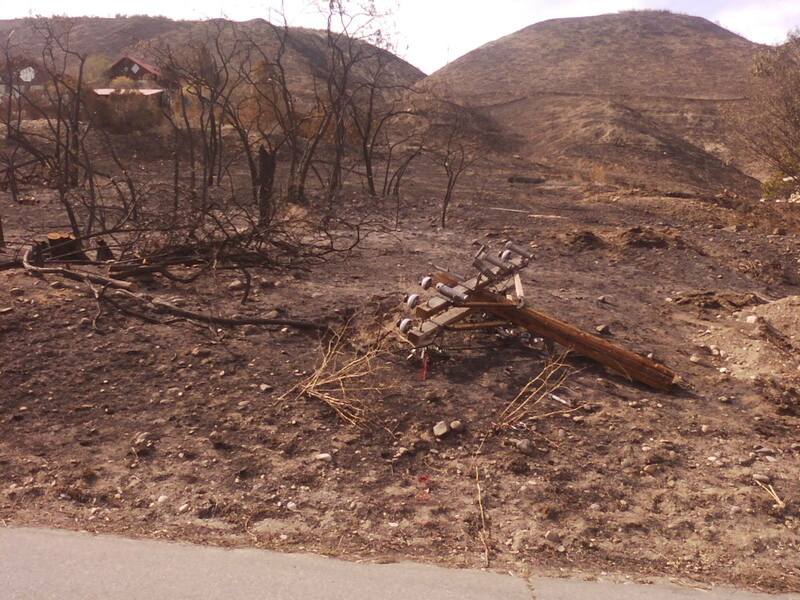 The town still has no power as 300 miles of wire and poles were burned and are down. They are hoping to get the main line along the highway and into town done over this weekend, but the laterals to the folks in the back country won’t be up for at least a month. Most of them are on generators, but there has been a rash of generator thefts. The orchard growers are bringing in big diesel generators to be able to water the orchards. They are estimating that they have lost 12 – 18% of their trees and fruit from the fire. A 75 year old smoke jumper team captain said in all his years of dealing with fires, he has never seen one as devastating as this one. By the way, my hot shower tonight was WONDERFUL!!!! 91 degrees and clear sky in Pateros today but the good news is power is back on to most of the town. The outlying areas (dirt roads to the interior) are still w/o electricity. However, we are bringing in food, water and tomorrow will begin to bring in ice to them. Temps are predicted to hit mid 90s tomorrow. People continue to show up at Pateros high School with trailers or truck loads og goods to donate. Talked with a couple today who drove from Walla Walla to Pateros to donate. (mapquest that one) Some folks were sharing that they had been allowed back into their property and were sifting through the ashes. they said the found some ceramic stuff intact (been fired already) but everything else was burned or melted. As in every disaster there are weird stories about things surviving. A family pulled their trailer away as the flames were rolling up the hills toward their place. Their buildings were destroyed, but the patio table, chairs and umbrella were still standing untouched. They are moving us to Brewster,WA in the next two days as they begin to restructure the approach. that will give us less driving to get to the affected area. Working in that temperature today was pretty draining. Kept hydrated, but I am really bushed tonight. Five more active days for me and then I outprocess and head home. Great experience here, but it really helps ground you in the reality of how fortunate you are to have a comfortable home and loved ones to return to. Flexibility. Plans changed. The fire blew up again in Black canyon which is 7 miles up the road from Pateros, so that’s where we were sent back to this morning. The scooper planes and helicopters along with firefighters on the ground handled it well. air was smokey for the morning but the fire was out. We made outreach trips to the Alta Lake area. 47 homes completely destroyed there along with many vehicles. Good news for the day is the temperature did not hit the predicted 102 degrees and stayed at 94. People are beginning to really come to our service center, which lessens our time driving the back roads looking for people. we’ve coordinated well with other agencies, and there is minimal duplication of services. At one point we thought we would be ramping down the operation, but there still is a lot of the forest hot and burning. The reception that we have gotten from the people here is very positive and welcoming. My big “in” with one of the local leaders is that her favorite uncle is named Rudy. What a lucky guy. The community at Pateros is ending their mass feeding tomorrow. They have been operating from the high school, but need to get ready for the school year. All the donations stored there (and as Jacob Marley would say about the quantity, “it is a ponderous thing) need to moved and stored by Friday. We will be working with the Southern Baptist group to continue the feeding from our ERVs. Temperature is rising, hitting 106 today. We have put up tent awnings to deliver our casework from, but it still gets quite warm under the tents. People continue to return and shift through the ashes. I have downloaded a couple of pictures of the area from my camera. You have to imagine 400 square miles looking like this. There is a picture of two cars in a driveway. The shiny ribbons of metal between them is melted aluminum from the cars. There is a constant smell in the air of wet ashes, like when you drown a campfire. Fire is now at the stage similar to a controlled burn. Most of the really hot spots are in the national forest. The terrain is rugged and remote and much of that will burn or be controlled by back fires. It has been a week now and the shock is setting in for the people. Business is picking up. Last day in the field. 109 degrees at 4:.00. Drank a LOT of water today. 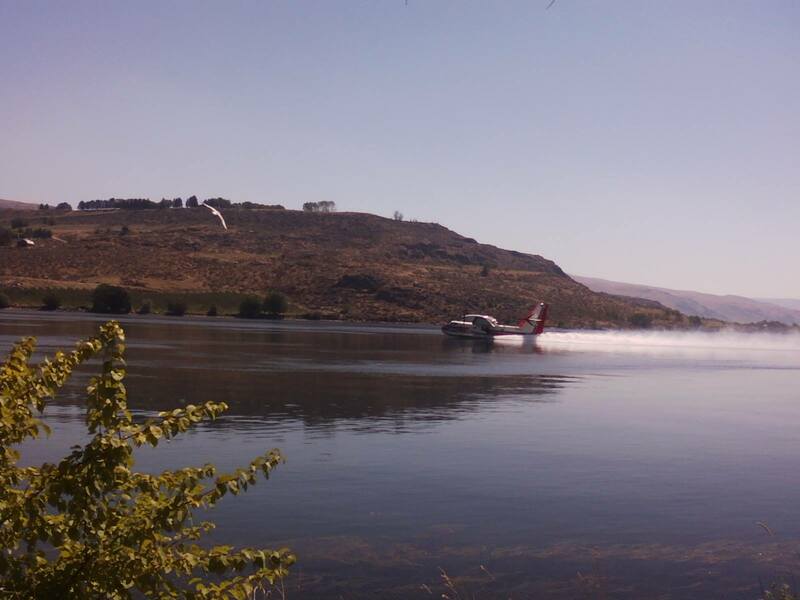 The fire flared up again and planes were ferrying water from the Columbia River back to the blaze and dropping it. Got a couple of pictures from the rise overlooking Pateros. Smoke made the air hazy for most of the morning, but it cleared off slightly by afternoon. Talked to one resident who lost his house who told me the ground got so hot the buried wires and PVC pipe melted. Attaching some photos of the planes scooping water from the river. tomorrow is my day off. Plan on a lazy day and doing some laundry. I out process on Thursday. If I don’t work that day I am going to try for a flight home. Got a nice goodbye from the folks in Pateros. 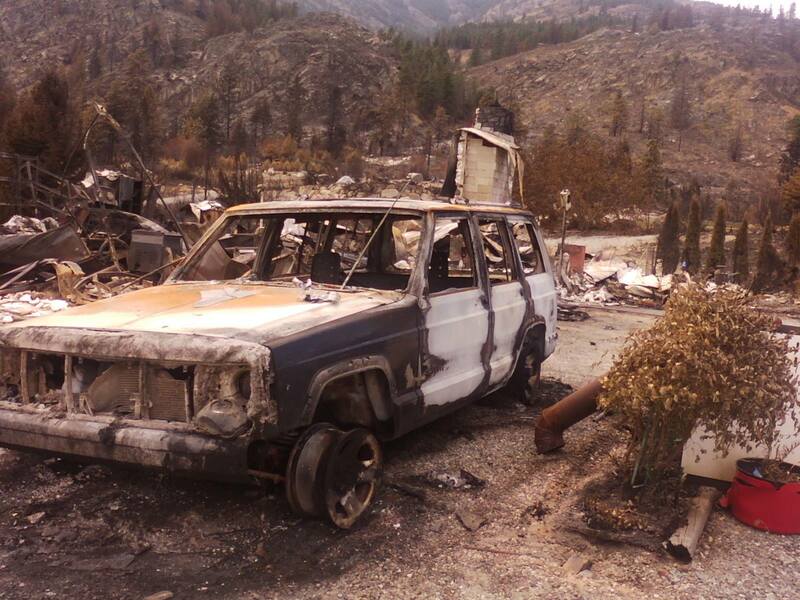 Disaster Mental Health Manager Diane Hermanson looks at damaged property from the Washington wildfires. 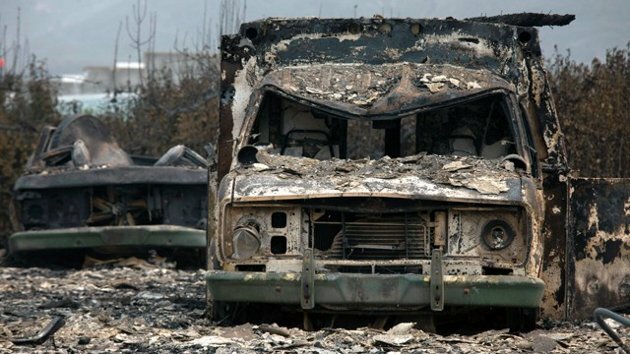 The fires have forced people to leave their neighborhoods and more than 200 people have stayed in numerous Red Cross shelters since the fires started. Wildfires have already destroyed almost 300,000 acres in Washington and officials are asking for other states to send firefighters to help put out the flames. 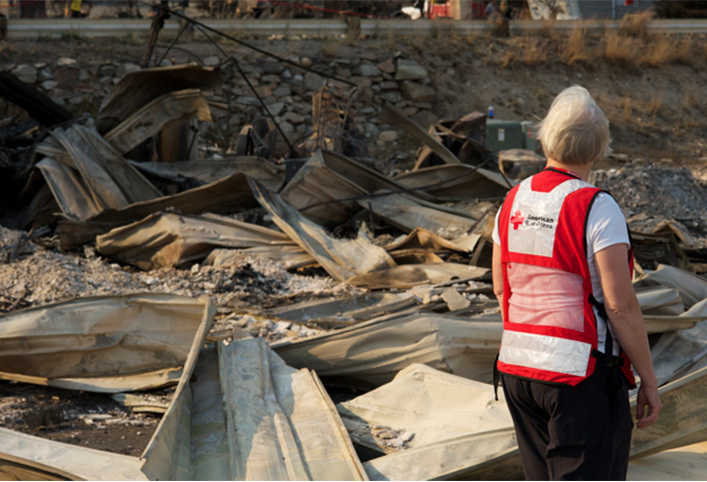 The American Red Cross is supporting the affected residents and first responders fighting to extinguish the blazes. The fires have forced people to leave their neighborhoods and more than 200 people have stayed in numerous Red Cross shelters since the fires started. Many others visit the shelters during the day to get the latest information about the fires and have access to other services. Red Cross workers have already provided more than 3,200 meals and snacks and the Southern Baptist Convention has opened a mobile kitchen to help the Red Cross distribute meals throughout the affected areas as they are deemed safe. They are also providing health and mental health services and meeting one-on one with people to determine what other services they need. The Red Cross is also distributing things such as trash bags, heavy work gloves and masks to people who are starting to sift through the ashes where their homes once stood. Red Cross workers remain in close coordination with Emergency Management teams to identify what additional help people may need. On Tuesday, July 22, Rudy Senarighi, of Sturgeon Bay, WI, packed his bags and was on a flight to Seattle, Washington to assist in the area of Disaster Mental Health. 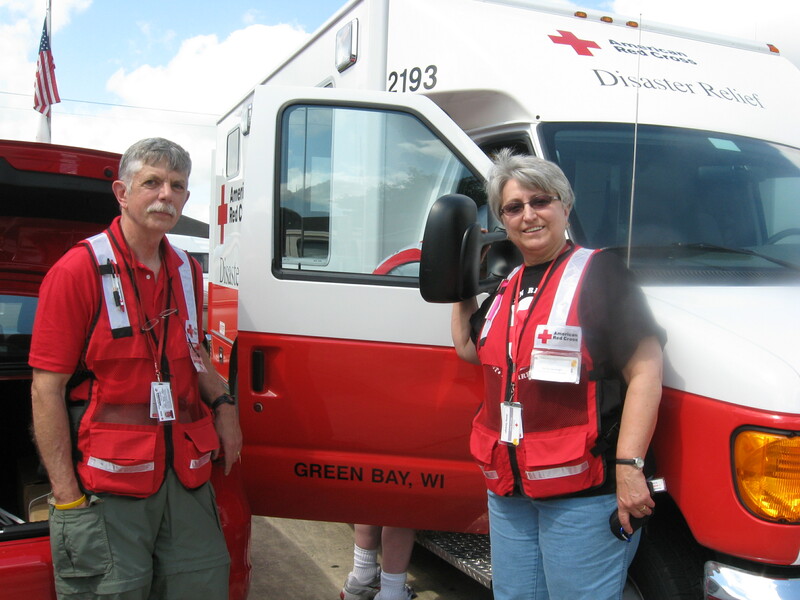 This is not his first deployment, and usually he goes out with this wife, Shirley, who is also a Red Cross Disaster Mental Health Volunteer. Between the two of them, the couple has over 60 years of professional experience as counselors, teachers and administrative supervisors. We are proud of Rudy for putting his life on hold to answer the call to help. Rudy is now into day three of his Red Cross deployment. We thank him for sharing his thoughts, experiences, and how the Red Cross is helping those impacted. Made it to Wenatchee. Really a pretty place on the floor of the river valley. Tomorrow I head up to Brewster, WA. Most of the place burned to the ground. Will be meeting with townspeople. We also will go to Omak which is nearby. There are 13 of us that will be divided into 6 teams. We heard tonight that the fire has shifted and is heading toward a wilderness area near the Canadian border. Spent the day in and around Pateros, WA connecting with people and bringing water to those in part of the burned out area. The town is still without power, but has drinkable water now. I am amazed at the heat that fire must have generated. Saw cars that had burned with puddles of melted aluminum around the ends of the axles from what had been the hub caps. The only evidence of some homes were cinder blocks stacked in a rectangle. I’m scheduled to go back to Pateros tomorrow with my partner to meet with the community. The big fire is 0% contained, but the fire fighters are trying to direct it NE. That is an area that was burned a few years ago and thus there is less fuel in that area for the fire to really burn. Today, just after my partner and I returned to Pateros, there was a lightening strike along the road we had just driven, and started another fire. These guys just can’t get a break. Pateros was an exciting day. Heard lots of stories, connected with many people. The fire was described by many as a “Fire Storm”. It rolled through the town and valleys very fast, only about 20 minutes. The fire trucks tried to keep up but they drained the cities water and couldn’t do anything more. The only interruptions came when the tanker planes flew over and scooped water out of the Columbia River, a sight I had only seen in movies. National guard moved in today and are doing 24/7 checks of property and people in the back country. Still some looting happening. People are very friendly and appreciative of our presence. we are working closely with the people of Pateros, they really have things under control, an exemplary job. Will go back tomorrow and set up a permanent site for Red Cross at the supply station there. Fire is 52% contained, but we were cautioned that contained does not mean controlled. however, the fire fighters are making progress every day. The hot weather and wind is a problem, both for the fire and for blowing loose ash and dust in the air. Skin feels pretty gritty tonight. But, they just moved us into a different staff shelter, Wenatchee High School. That means hot water and showers tonight. The work of the American Red Cross is made possible by donations. Donations can be made by visiting redcross.org, calling 1-800-RED CROSS (1-800-733-2767) or texting the word REDCROSS to 90999 to make a $10 donation. Contributions can also be sent by mail to a local Red Cross chapter or to the American Red Cross via P.O. Box 37243, Washington, DC 20013. On Friday evening January 18 the Third Avenue Playhouse in downtown Sturgeon Bay hosted a benefit concert for Hurricane Sandy relief. This concert was put together by musician Jeanne Kuhn’s and friends. In-between acts Red Cross volunteers from Door County and had been deployed to New York and New Jersey shared their experiences with the audience. Everyone that performed, ran the lights and sound system donated their time for this fund raiser. $1,000 was raised for Sandy disaster relief efforts. To view additional photos from the concert click HERE. Two American Red Cross volunteers from Sturgeon Bay have answered the call of duty and are now on the East Coast helping those hardest hit by Hurricane Sandy. What some have dubbed a “superstorm” decimated several eastern states after it touched down last week, leaving people homeless or displaced and without power, food and water. The category 1 storm caused schools, businesses and mass transit to shut down. 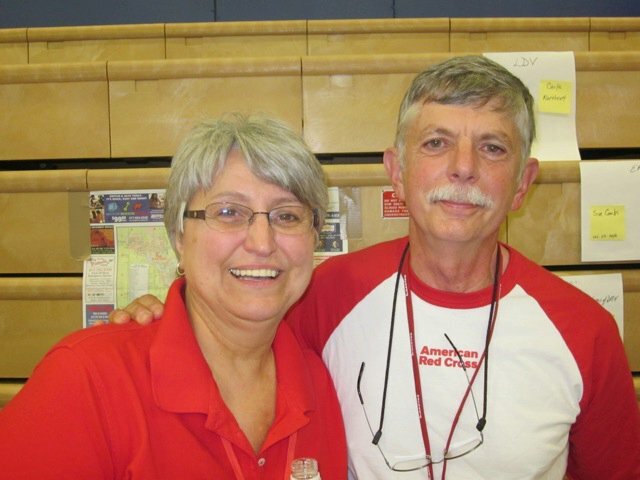 Red Cross volunteers Rudy Senarighi and Ron Maloney were deployed to New Jersey and Long Island respectively. Senarighi, who spent more than 25 years as a guidance counselor with the Green Bay School District and later the Sturgeon Bay School District, is working as a mental health supervisor. He arrived on Oct. 31 in Philadelphia and drove to Somerset, N.J. From there he was sent to Tinton Falls, N.J. He is with a team of five other mental health workers and nurses. Since reaching New Jersey his team and others have made 17,000 support contacts. Part of Senarighi‘s job is to make contact with those who might need mental health services and put them in touch with agencies that will be able to assist them in the coming weeks. The nurses and counselors offer “health services and emotional support contact,” Senarighi said. He said the volunteers are really only able to give “Band-Aid” care. There are 5,300 people from all over the country volunteering in the hardest-hit areas, he said. Right now people are most concerned with an impending storm that was due to hit today. “The big issue right now there is a nor’easter predicted for Wednesday, and it’s supposed to be a big one,” Senarighi said. The last thing people need is to deal with is cold and rainy conditions on top of everything else, he said. As his team travels from shelter to shelter, they’ve seen the destruction left by the storm. “You know the beaches are wiped clean, the downtown areas are deserted, the sand from the beaches is piled thick and high,” he said. Power companies with crews from all over the country and road crews are working around the clock to get people back on track. “Boy, it’s a mess,” he said. “Lots and lots of water damage, as you’d imagine,” he said. People have had to throw out furniture and mattresses that were ruined by the flooding. While schools have been closed in New Jersey, Senarighi has seen many of the local high school students volunteering at the Red Cross center, manning the phones and helping with other tasks. Schools are slated to open today or Monday. Senarighi is slated to return home Nov. 16. For Maloney, who left Sturgeon Bay on Saturday for the East Coast, his pitching in and helping has gone a little slower, since the city of New York is still turning its city-run shelters over to the Red Cross. With all the volunteers coming in, people are still being given their assignments. Maloney is currently stationed, for a minimum of three weeks, at a Red Cross bulk distribution center on Long Island. He and other volunteers are staying in a Marine barracks. His job is to help get trucks loaded and drive the supplies to the designated shelters. Monday was Maloney’s first full day on the job. He distributed supplies to a shelter being run out of a Church of the Nazarene. The shelter is not affiliated with the Red Cross, but the volunteer organization does supply to shelters in need of supplies. He said going from shelter to shelter can take anywhere from a half-hour to two hours. Maloney and Senarighi were astounded at how long the lines are for gas stations. A few miles west of the coast, there are still lots of power outages, meaning traffic lights were not working. Also, many gas stations had either run out of gasoline or didn’t have the power to pump the gas, Maloney said. Senarighi saw gas lines that went on for seven miles. Both men are touched by the strength of the human spirit that they see around them. “It still amazes me, this is like my ninth deployment for a national disaster, and I continue to see people helping people,” Senarighi said.